The Happiest Sad: I'm Awesome! I have, on more than one occasion, noticed a number of blog awards floating around. I won't mention any awards or blogs by name, since I read about 100 blogs on a regular basis (I need to get out of the house more). But there are "Kreativ" blogger awards, and "Beautiful Blogger" awards and awards with flowers on them, and teacups, and kittens, and mermaids and quilts and all manner of cutesy little things. I once envied them - the recipients of those blog awards. I had it in my head that a blog award was validation; it said that the awardee (is that a word?) was delightful and lovely and that people liked them. I aspired to earn a blog award. I wanted validation. I wanted people to like me - and I wanted PROOF that people liked me. I wanted a blog award. I wondered for a time if there was a website where people submitted their blogs for award consideration, like the movie folks do with the Academy Awards. I poked around, and as it turns out ... I couldn't actually figure out how on earth these awards were getting around, or how they started. And, eventually, I gave up. And so I decided that if no one else was going to give me a blog award, I'd give one to myself - not just give it to myself, but make it myself. And it wouldn't just be any old teacup or patchwork award. I wanted something different and fun and quirky like me. Well, nothing says "quirky" like a chicken! I went through some of my winter zoo pictures and found a likely candidate, and opened it in Paint.NET. 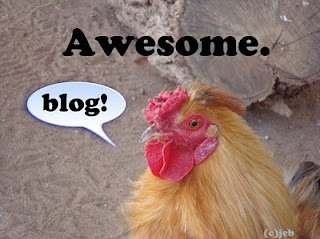 And so here it is, peeps: the Awesome Blog Award, featuring Captain Cluck. I'm pretty awesome, and I have an awesome blog, and now I have a blog award to prove it! I bet that a lot of you (if not all of you) are pretty awesome, too. Wouldn't you like an awesome blog award, too? Sure you would. So Captain Cluck is here for the taking (although he probably needs re-sizing, something I'm too lazy for). Right-click, save, and knock yourself out. You don't have to list any little-known secrets about yourself, and you don't have to nominate anyone. I'd get a kick out of it if you linked Captain Cluck back to my little blog, but I'll leave that to your discretion. You could also e-mail me with your blog URL so I'll know you're awesome, but that, too, is up to you. Self-confidence shouldn't come with strings attached! Captain Cluck thinks you're awesome. Don't you think you're awesome, too? Love it! I especially love the no strings attached. I have already listed enough quirks about myself on my blog, I'm sure if I came up with more then I'll start looking insane instead of quirky. whoo! I want to be awesome on my blog too. I'm sure I can make a spot for that plucky chicken to link out blogs together! LOL! Follow this link at your own discretion. I recently discovered this blog. It is irreverent, obnoxious, and full of filthy language, but it is so funny it makes me cry. Too funny. I love that you made your own award. And Margaret, your blog is awesome! Captain Cluck says so. Pretty darn accurate award you got there! Thanks for the validation, Jill. I just put Captain Cluck on my sidebar to make me feel awesome (he also balances out the cutesy-ness of my blog) and when you click on him it links back HERE to your awesome blog!